Thank you for reporting your concern to the Town of Westwood via Commonwealth Connect. We have reviewed the information you provided our staff and will be investigating this issue further. The Town of Westwood staff will provide regular updates here as we work towards resolving this issue. You will be notified via email about our progress. Thank you again for helping us improve our community! I understand that the street sign is in the process of being replaced. In the mean time, why is there no temporary cone showing a keep right sign for the island. At night, this is not visible. When a keep right sign falls over, it really should be temporarily replaced so that a car doesn't drive right up on the median. 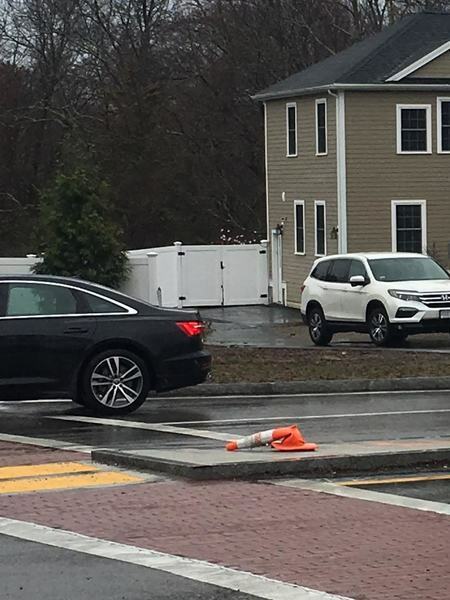 If the Westwood DPW thinks differently about this fine, but temporary keep right signs are installed in Newton when they fall over. Stop sign still needs to be reset and the sign (including Adams Farm signage) for both streets is missing. There is a cone where the sign had been. These are both from accidents are replacement/repair is being coordinated with contractors. The cone doesn't help. A temporary keep right sign or larger cone would be helpful. Take note of the picture. This sign fell down and has gone unreplaced. Any plans on repairing / replacing the "Do Not Pass" sign on 109 Eastbound near Pond Street? It's not at all visible at nighttime anymore and has lines and marks all over it. Street sign pole needs reset.